BUSAN, South Korea, Oct 4, (AFP): Anew list of the best Asian films of all time was published this week, as the region’s increasingly vibrant cinema scene celebrated another bonanza in Busan. 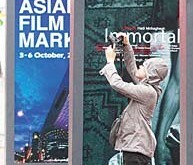 The 20th anniversary of the Busan International Film Festival, in South Korea, marked its milestone with a poll of noted Asian filmmakers and international critics of Asian film, who were all asked for their top ten. Oscar front-runner Hou Hsiao- Hsien said the release of the “Asian Cinema 100” was a reminder to fellow filmmakers of their obligation to “seek the truth.” “Sometimes as a filmmaker you have to show things that people don’t want to see,” said the Taiwanese director. Hou’s breakthrough work “A City Of Sadness” was ranked fifth-best of all time on a list that was topped by Japanese master auteur Yasujiro Ozu’s seminal family drama “Tokyo Story” from 1953. Hou’s new film, atmospheric martial arts epic “The Assassin”, which he has brought to Busan, is among the early critics’ favourites for this year’s Best Foreign Film Oscar after last week picking up 11 nominations for the Golden Horse Awards, the most prestigious given to Chinese-language films. But its mood and mysticism are a far cry from the harsh realities of Taiwanese history portrayed in “A City Of Sadness”, which follows the destruction of a family under the “White Terror” campaign instigated when martial law was imposed across the island in the late 1940s. It is widely acknowledged that the film was the first to confront this dark period of the island’s past and “A City Of Sadness” was a major critical success, winning the island nation its first Golden Bear award from the Venice Film Festival. “If it had not been for the awards overseas it would not have been screened in Taiwan,” said 68-year-old Hou when asked how he remembers the film. The poll also rated Asia’s top directors of all time with Japan’s Ozu coming out ahead of Hou, and Iran’s Abbas Kiarostami, whose highest-ranked film was 1994’s “Close Up”, coming tied 10th with the highest-ranked Korean film, Kim Ki-young’s sexually charged drama “The Housemaid” (1960). Festival organisers said they had created the list of the region’s greatest films to widen the world’s knowledge about its cinematic history. They are this week screening a selection of the films chosen. Updates are expected every five years. Asia’s most successful film in terms of global box office, the Oscar-winning Ang Lee-directed martial arts epic “Crouching Tiger, Hidden Dragon” (2000) from Taiwan which collected an estimated $128 million, was voted in joint 18th position. ■ “Tokyo Story” (Japan) Yasujiro Ozu was a firm believer in the less-is-more style of storytelling but don’t be fooled by the slow pacing — it’s the pure emotion here that packs the knockout punch. When an old couple head to Tokyo from the countryside to visit their children they find themselves unwanted — even unloved — by all but one, played by a soulful Kyoko Kagawa. An indictment of the self-centred nature of modern life as it was back then in 1953, the heartbreak comes when you are left wondering if that’s how things still are today. ■ “Rashomon” (Japan) Cinema was Akira Kurosawa’s grand stage and the world had never seen anything quite like this twisted tale of death and deceit when it came to cinemas in 1950. There’s the story, first, with murder shadowing the moves of every character. But the genius is in the way Kurosawa unravels it all — each character (including the one played by the brilliant Toshiro Mifune) is allowed their own take on how a murder occurred. The result is that you won’t know just who to believe. A Golden Lion followed at Venice, as well as an honorary Academy Award. ■ “In the Mood for Love” (Hong Kong) Wong Kar-Wai’s richly evocative tale of longing and simmering passions in 1960s Hong Kong is among the most stylish of productions to ever grace the big screen. Maggie Cheung and Tony Leung Chiu-Wai play the would-be lovers whose affair simmers through glances and stolen moments but never fully bursts into flame. The way cinematographer Christopher Doyle’s cameras seems at times to invade their most intimate moments will almost make you blush. ■ “The Apu Trilogy” (India) Master filmmaker Satyajit Ray produces an epic in every sense of the word, lifting his inspiration from a series of three famous Indian novels and tracing the coming of age of the impoverished Apu who struggles — almost silently — to rise above his situation. Made in the mid-1950s on a next-to-nothing budget with nonactors, Ray’s lyrical representations of the life of the common man in his country changed the very notion of Indian cinema. ■ “A City of Sadness” (Taiwan) Hou Hsiao-Hsien’s 1989 release turns its attentions to the very human face of the White Terror campaign launched across Taiwan following the arrival of Kuomintang forces who had fled China following the civil war there. The focus is on the Lin family, each member of which suffers horribly at the hands of the authorities, and it includes a standout turn by Hong Kong’s Tony Leung Chiu-Wai as the deaf-mute brother fighting for justice — and some semblance of sanity amid the mayhem.